What should go on the blog was hot on the agenda at the Hilton Hotel in Helsinki on the way out here . Mike B thought he’d rather not know about Charlie and the banya, Simon R thought the bell ringing piece added a touch of local interest and charm. 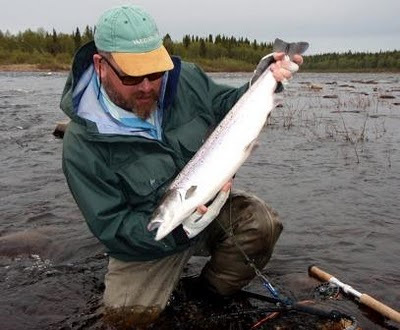 Paul C said he’d had to wait a long 51 weeks to get back here so bring on the full bloodied fishing notes and photos of salmon and bin the rest. In celebration of Paul C catching an 8lb pike on a fly yesterday (Paul - we are here to catch salmon!) I will stick to fishy stuff today. A warmer night, no frost and today is cloudy, mild with hint of rain in the air. Quite a stiff wind from the North East. Not the easiest of casting conditions but it feels fairly ‘fishy’. The water temp remains at 10°C with an air temp of 16°C. 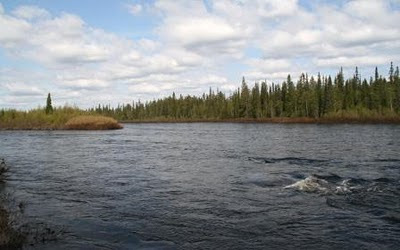 The topical discussion in camp is the water height for the remainder of the season, and I know that those of you fishing in June are showing a keen interest too. Below is a rather dull photo taken at midday of the Heli Pool at the Lower camp, those who know the pool will note that Sharks Tooth Rock remains just a boil. If the water is over Sharks Tooth the river is quite big and could be termed ‘high’. I have checked the Red Book, in which Keith has recorded the daily water heights for 14 years. The height is measured from Keith’s Nail, which he drilled into a rock in 1996 and we use it as a very useful gauge. 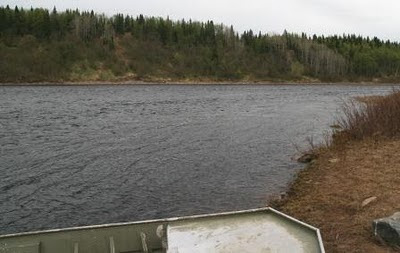 The water height drops to Keith’s Nail on average around 25/26 May - at this point the main melt flood will have gone and the water starts a steady, daily drop unless either we get rain or unless we have snow and frozen tundra left. From Keith’s Nail we would expect the water to drop an inch or two a day. This year the water level was at Keith’s Nail on 22 May. With our reserve of snow and ice gone in this very warm and early spring the water is now dropping faster than normal, about three to four inches a day. A similar year was 2006, our last ‘low water’ year, when we hit Keith’s Nail on 16 May and had little snow reserves in the watershed. June water levels are going to be dependent on rain, if we do not get it then I suspect we will find boating tricky in some places. The bad news is that we may have to walk to some pools, the good news is that the fishing here can be excellent in low water. The Middle score yesterday (24th) was 82, better than I anticipated and today they are reporting 82 fish again. Kitza had 24 to the six rods and Lower Camp had 26. All camps reported bigger fish today with a healthy number over 10lbs, 25% of the fish yesterday from Lower were in double figures. To put the camp scores into perspective it is worth remembering that Middle is fishing double the number of rods (12) and dare I say it, all of them have been here ‘quite a few’ years. Lines are still an eclectic mix from sinking to floating – while the water remains warm my advice remains ‘go for distance not depth’ in other words fish a line you can cast best with.